I’m on the road and check in to my hotel. The room is nice, everything you’d expect, even hope for. Maybe more. A kitchenette with dishwasher, full refrigerator/freezer, stove top, microwave and coffee maker. There’s a little kitchen table, a couch and easy chair. Free WiFi, flat screen HD TV that rotates so you can see it from almost anywhere. The sleeping area is separated with a full dresser and two bedside stands. And then there’s the closet. No door. An upper shelf with a handful of hangers. And another shelf too close below that upper one. 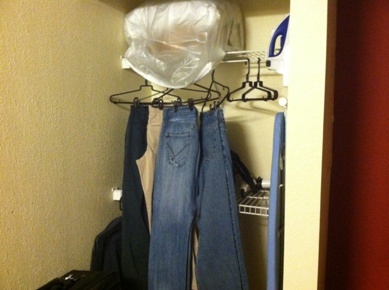 So close that if I hung my clothes on the upper shelf they’d actually catch on that lower shelf and get all wrinkled. I could have done without the garbage disposal, even without the stove top if they’d only given me a full size closet.